A louder-than-usual fan in your computer, or one that's making strange noises, isn't something to ignore. These sounds are usually an indication that a fan is not working properly—a potentially serious problem. Fans located throughout the inside of the computer help remove the large amount of heat generated by the CPU, graphics card, power supply, and other hardware on your computer. When heat builds up inside the computer, those parts heat up until they quit working...often permanently. Below are three distinct strategies for solving a noisy fan problem, all of which are worth investing some time and effort into. That said, cleaning the fans should be the priority if you're looking for the most likely solution. A lot of other "computer fan troubleshooting" articles out there recommend software tools that force your computer's fans to slow down, but I never recommend those. 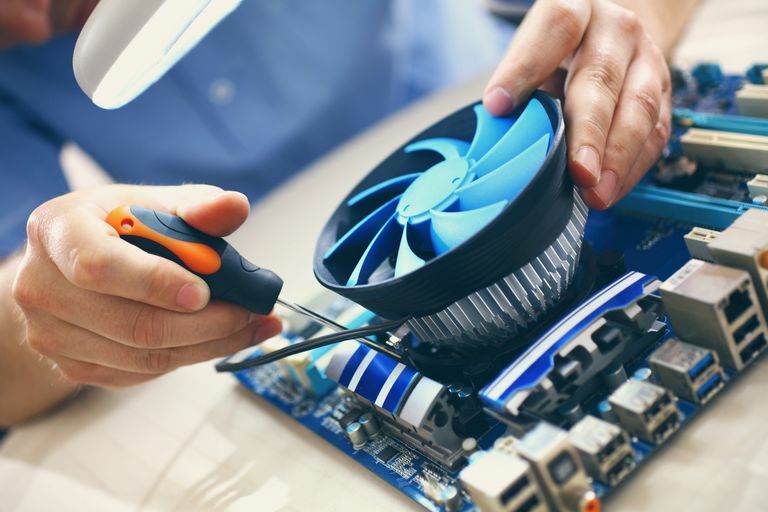 There's usually a very good reason for a fan to be running fast or making noise, the root cause of which you're working to solve with the steps below. Time Required: It'll probably take around 30 minutes to clean all the fans in your computer, maybe less if you have a laptop or tablet, and more if you're using a desktop. Clean the CPU fan, as well as graphics card fan and any other component fans you might have like for RAM modules or other motherboard based chips. Canned air works great for CPU and component fan cleaning. You can usually pick up a bottle for around $5 USD at Amazon. Keep it upright, make sure the computer is turned off, and do the dust blowing outdoors if possible. Laptops & Tablets: Your computer may or may not have a CPU fan and likely does not have a fan for other components. If you have trouble figuring out which panel to remove to access the CPU and fan, take a look at your computer's manual online. Desktops: Your computer will almost certainly have a CPU fan and will likely have a graphics card fan (a GPU fan). See How to Open a Desktop Computer Case if you've never had to get in before. Clean the power supply fan and any case fans. Canned air works great here, too. Laptops & Tablets: Your computer probably only has one fan and it's blowing out. Avoid blowing the dust directly back into the computer, which could aggravate the fan noise problem in the future. Instead, blow air at the fan at an angle, blowing the dust away from the fan grates. Desktops: Your computer has a power supply fan and may or may not have inflow and outflow case fans. Blow these fans from the outside and the inside until you don't see any more dust flying out of them. If after cleaning a fan, it doesn't move at all, it's time to replace it. Check first that the fan is plugged into the motherboard or whatever is providing the power, but beyond that, it's time for a new one. If the fan is still working but not much better, or if it still isn't behaving like you think it should be, keep reading for some more ideas. Due to safety concerns with power supplies, don't open the power supply and replace only the fan; the entire power supply should be replaced instead. I know that might be a big expense, and fans are cheap, but it's not worth the risk. It's very possible that your fans are all in perfect working order and, now that they're clean, running better than ever. However, if they're still making a lot of noise, it may be because they're being asked to do more than they're designed to do. In other words, your computer is very hot and, even with great fans running at full speed, they can't cool your hardware down enough to slow down—thus the noise! There are plenty of ways to cool down your computer, from moving where it is, to upgrading to a better fan, etc. See Ways to Keep Your Computer Cool for a complete rundown of your options. If those ideas don't work, or you're not able to try them, it's time to look at why your hardware might be being pushed to its limit. Unless your fan-cooled hardware has a physical issue and is heating up and making your fan noisy for that reason, your operating system and software are the primary reason your hardware works more (i.e. gets hotter). Open Task Manager. The Ctrl+Shift+Esc keyboard shortcut combo is the quickest way there but the link has some other methods, too. Task Manager is a behemoth of a program. See our Task Manager: A Complete Walkthrough if you're interested in everything it can do. Tap or click on the Processes tab. If you don't see it, try the More details link at the bottom of Task Manager. Once on the Processes tab, tap or click the CPU column so the programs using most of the CPU's capacity are listed first. Typically, if an individual program is "out of control" the CPU percentage will be very high—at or close to 100%. Programs listed in the single digits, even up to 25% or more, typically are not a concern. If a particular process seems to be driving CPU usage through the roof, which will almost always also be reflected as serious computer fan activity, that program or process may need to be repaired. Your best bet is to jot down the name of the program and then search online for the process and high cpu usage. For example, chrome.exe high cpu usage if you were to find chrome.exe as the culprit. Updating the drivers to your video card is an easy step you might want to try as well, especially if the GPU fan is the one that seems to be causing the problem. This isn't a probable fix for a speedy GPU fan but it could help and is super easy to do. See How to Update Drivers in Windows if you need help.